Since the day that God created people, God has always loved them and desired to bless them. But our rebellion and sin raised a great barrier between us and God. 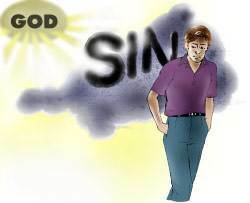 The Bible says, "Your iniquities [sins] have separated between you and your God, and your sins have hid His face from you…" (Isaiah 59:2). It was the Father's will that His Son come into the world to remove this great barrier of sin that stood between Himself and people. Because the penalty for sin is death, this could only be done by Jesus' bearing our sins on the cross and dying for them. Many people do not understand why Jesus had to die on the cross. They say, "Why couldn't God just forgive us? Why did Jesus have to die?" 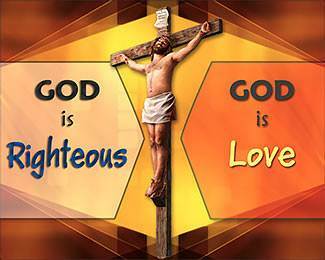 The reason why God could not "just forgive us" is that He is absolutely righteous. This means that He always does what is right. God has His way of doing things, and His way is always righteous. The Bible says, "He that justifies the wicked, and he that condemns the just, even they both are abomination [hateful] to the Lord" (Proverbs 17:15). Whatever God does, He does in perfect righteousness. Because God is righteous, He must punish those who disobey Him and break His laws. The Bible says, "The Lord is righteous in all His ways, and holy in all His works" (Psalm 145:17). Concerning our salvation, God was seemingly faced with a very difficult problem. God loves us and He wants to save us. But He must save us in a way that satisfies Him and satisfies His righteousness. We, therefore, should be punished. God loves us and wants to save us. Suppose that I am the principal of a school, and I make a rule that there is to be no cursing. I write the rule on the chalkboard, and the whole school sees and hears it. I say also that there is to be a punishment if anyone breaks the rule. In the school there is a boy named Jimmy, whom I love very much, but Jimmy gets into a lot of trouble. I have had to punish him several times. At recess Jimmy curses. Everybody hears him, and I hear him also. Everyone knows that I hear him. When recess is over, all the children come into the auditorium. All the students are looking at me to see what I will do. I have a son of my own in the room. John is my only son, and I love him dearly. I ask John to step out in the hall with me. I say, "Son, Jimmy has broken my rule. There must be a punishment. I must keep my word. Jimmy thinks that I hate him because he broke my rule, but you know that I love him. I want to ask you, 'Will you take Jimmy's punishment for him?'" My son says, "Yes, Father, I will do anything for you that you wish. And I love Jimmy too." I bring my son before the whole school and I say, "Jimmy has broken my rule against cursing. You know that I said that there is to be a punishment if anyone breaks my rule. "I must keep my word. But my son John says that he will take Jimmy's punishment. He says that he will do this gladly for me and for Jimmy." Then I punish my son. I punish him just as if he had broken the rule himself. When the punishment is over, I say, "Jimmy, I want you to know that I love you and I have nothing against you—nothing at all. 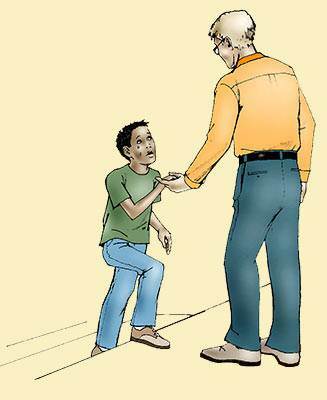 I want you to come forward now and give me your hand." Jimmy comes forward in tears. He takes my hand and says, "I did not know that you loved me that much!" Christ's death on the cross was a very unusual situation. He was the Christ, the One chosen and anointed by God to be our Savior. He perfectly glorified God. Yet this Man, who was a delight to God, died a terrible death on a Roman cross, forsaken by His friends, His disciples, and by God Himself. Crucifixion was the most shameful and the most painful death ever devised, and it was reserved for the worst of criminals. Think of God's Son being put to death in such a shameful way! Who put Jesus on the cross? 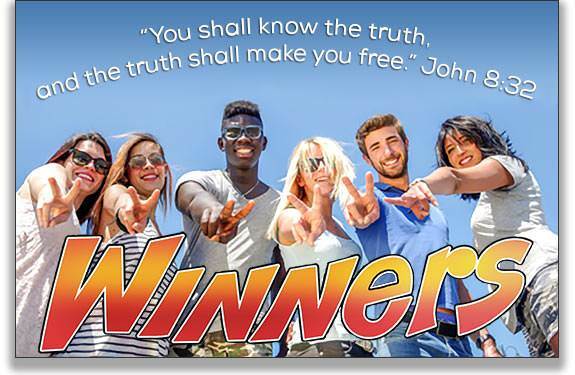 We might point to Judas, who betrayed the Lord for thirty pieces of silver. We might point to those who delivered Jesus to the Roman governor, Pilate, and demanded that He be put to death for blasphemy. We might point to Pilate, who knew that Jesus was innocent; yet he lacked the courage to go against the crowd, but gave in to them and sentenced Jesus to be crucified. But none of these put Jesus on the cross. Who put Jesus on the cross? The surprising answer to this question is this: God put His Son on the cross! It was because of our sins that God put His Son on the cross. God took all of our sins and laid them on His Son. Jesus Himself chose to go to the cross. Jesus said, "Therefore does My Father love Me, because I lay down my life… No man takes it from Me, but I lay it down of Myself…" (John 10:17-18). It was because of our sins—my sins and your sins—that God put Jesus on the cross. The Bible says, "All we like sheep have gone astray; we have turned every one to his own way; and the LORD has laid on Him the iniquity [sins] of us all" (Isaiah 53:6). When our sins were laid on Christ, God's wrath against sin was poured out on Christ. God's wrath was not against Christ personally. 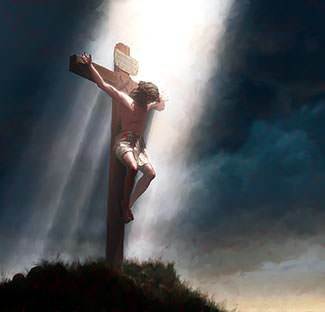 He was never more precious to His Father than when He hung on the cross, for He was doing His Father's will. God's wrath was not against sinners. God loves sinners. That is why He gave His Son to die for them. What then, was God's wrath against? 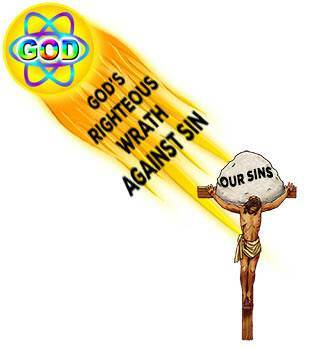 God's wrath was against SIN! All the punishment that you and I deserved, Christ bore on the cross. Christ's death reveals the righteousness of God. In taking our place and paying the full penalty of our sins, Christ glorified God with respect to our sins. God can now righteously forgive the sins of all who believe on His Son. God does not overlook our sins, or pretend that He does not know about them. He forgives them righteously because He sees the blood of His Son which was shed for them. For thousands of years, people had brought their lambs and offered them to God as sacrifices for their sins. But these were imperfect sacrifices which could never take away our sins. 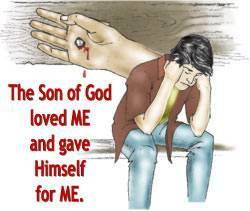 God is now saying to us, "I have given My Son as the perfect sacrifice for your sins. He is the Lamb of God who takes away the sin of the world." Is God satisfied with the sacrifice which He Himself provided for our sins? Yes, God is perfectly satisfied! The Bible says, "…whoever believes in Him [Jesus] shall receive remission [forgiveness] of sins" (Acts 10:43). Christ's death reveals the love of God. God loves sinners! He is "not willing that any should perish." God showed His great love for us by giving His Son to die for our sins. The Bible says, "God shows His love toward us, in that, while we were yet sinners, Christ died for us" (Romans 5:8). The death of Christ on the cross is the greatest proof that God loves us. To those who doubt His love, God can point to the cross and say, "I have loved you with an everlasting love. I showed My love for you by giving My only Son to die in your place. When you see Him, suffering and dying on the cross for you, how can you doubt My love?" We must never forget what it cost God to forgive us. It took nothing less than the death of His Son on the cross for God to forgive us righteously. Jesus is our living Savior! 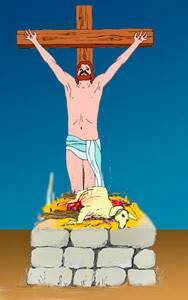 Jesus was crucified about nine o'clock in the morning. He died about three o'clock in the afternoon. From noon until three o'clock, there was darkness over the face of the earth. Jesus cried out, "Father, into Your hands I commend My spirit." The God-man had died. Jesus died on the cross, but He did not stay dead. He rose from the grave on the third day. He is our living Savior! God has promised eternal life to all who take Him as their Savior. Can God really make His children alive again after death? Yes, He can! We know He can because He raised His Son from the dead. Jesus said, "Because I live, you shall live also" (John 14:19). He goes to be with Jesus in Heaven! 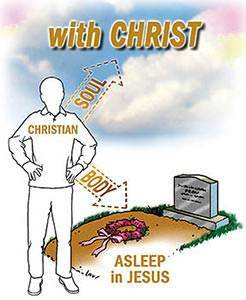 The body is laid in the grave, but the person—soul and spirit—goes immediately to be with Jesus. If you have taken Christ as your Savior, you do not have to fear death. For the child of God, death is like walking from one place into another. We go from this life with all its sorrow and suffering into Heaven, to be forever with Jesus and with our loved ones who trusted Jesus as their Savior. When Jesus comes again, He will give us wonderful, new, resurrection bodies like His glorious resurrection body. What will we be like then? We will be like Jesus! The Son of God died a terrible, lonely death on the cross, forsaken by His friends, His disciples, and by God Himself. God put His Son on the cross, because there was no other way we could be saved. Men could never have crucified God's Son had it not been His will. It was our sins that made Christ's death necessary. God is perfectly satisfied with the sacrifice which He Himself provided. He forgives the sins of every person who takes Jesus as his Savior. Isaac was the only son of Abraham and Sarah. Isaac married Rebekah and they had twin sons—Esau and Jacob. Esau was born first and was entitled to the birthright—the special, spiritual blessing that was the right of the firstborn son. The birthright included the great privilege of being one of the ancestors of Christ. When the boys grew up, Esau became a hunter and a farmer. But Jacob was a man who stayed at home. One day Jacob had prepared a delicious meal of lentil stew for himself. 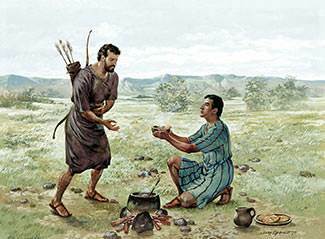 When Esau came in from hunting, he was very hungry, and begged Jacob to give him some of the stew. Jacob offered to trade Esau some of his stew for his birthright. Esau readily agreed to this. He sold his birthright for a bowl of stew! This really grieved God. Later, Jacob tricked his father into giving him the birthright blessing that rightfully belonged to Esau, the older son. This made Esau furious and he determined in his heart to kill Jacob some day. To escape the anger of his brother, Jacob had to leave home. He went to the land of Haran, where he worked for his uncle Laban. In time Jacob became very wealthy. He had four wives—Leah, Rachel, and their two servants, Bilhah and Zilpah. From his wives Jacob had twelve sons and one daughter. The twelve sons became the heads of the twelve tribes which later became the nation of Israel. As he was returning to the land of Canaan with his wives, his children, and all his possessions, Jacob received word that his brother, Esau, was coming to meet him. Esau had 400 men with him. Jacob's heart was filled with fear at the thought of what his brother might do. He immediately began planning and scheming to appease his brother. That night, in his desperation, he went out alone to pray. God, in the form of a man, met Jacob, wrestled with him, and made him lame. Though he was now crippled, Jacob held on to God, saying, "I will not let You go, unless You bless me." God did bless Jacob. He changed his name from Jacob, which means "deceiver," to Israel, which means "prince with God." God also changed Esau's heart so that he was no longer angry with Jacob. Jacob was a schemer, but he loved the things of God. God loves a person who loves Him and loves His things. 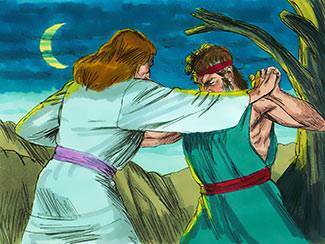 But God had to discipline Jacob all his life. Jacob's last days were his best days. He had learned to trust God to work things out instead of trusting in himself and his schemes. He had become a real "prince with God" and a true worshipper of the living God.